Sometimes what we are seeking is right there in front of us at the beginning of day through we see it not: pale sunlight coming through the window and high drifting clouds beyond, the lively chatter of starlings in flight. Within, there is the hum of the kettle on the fire, the perfect turquoise glaze of pot and drinking vessels, fragrant steam rising, sweet ambrosia in the cup. Another awesome photo and words to accompany. Oh how funny. I just offered Tabor a cup. Hopefully she will stroll by and partake of yours. Lovely, Cate. the photo stands on its own. 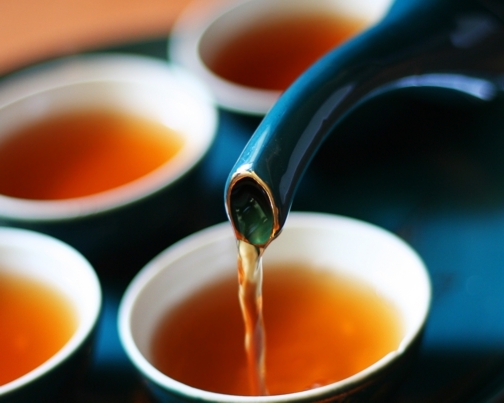 the clarity of the warm tea, teacup, and teapot draw me in to a zen moment. a stand still of time, luxury of thought, to untangle the ritual of tea.